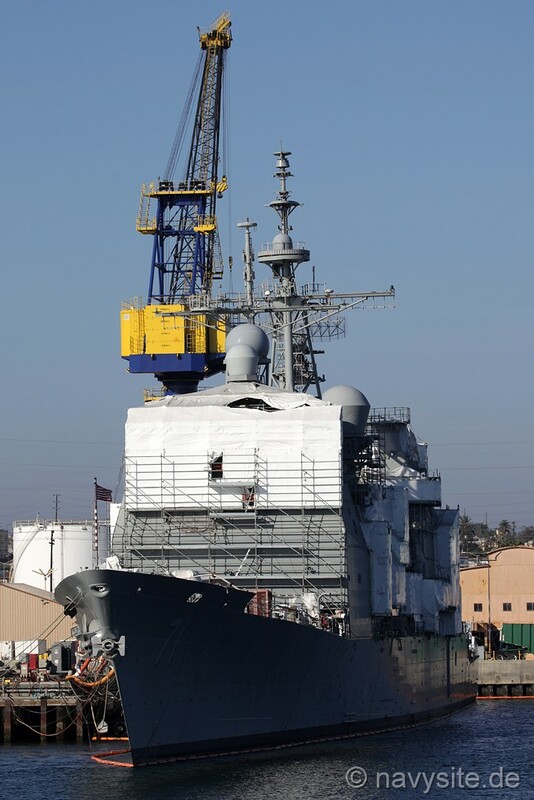 USS CAPE ST. GEORGE, the first ship in the United States Navy to bear the name, is the twenty-fifth ship in the TICONDEROGA - class of guided missile cruisers, and the seventeenth built by Ingalls Shipbuilding of Pascagoula, Mississippi. 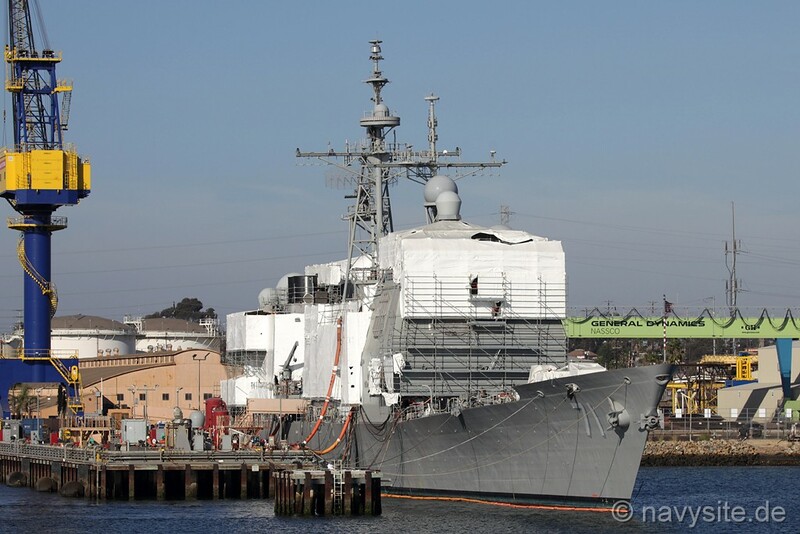 In July 2007, the CAPE ST. GEORGE shifted her homeport from Norfolk, Va., to San Diego, Calif., as part of the adjustment of forces from the Atlantic to the Pacific. This section contains the names of sailors who served aboard USS CAPE ST. GEORGE. It is no official listing but contains the names of sailors who submitted their information. 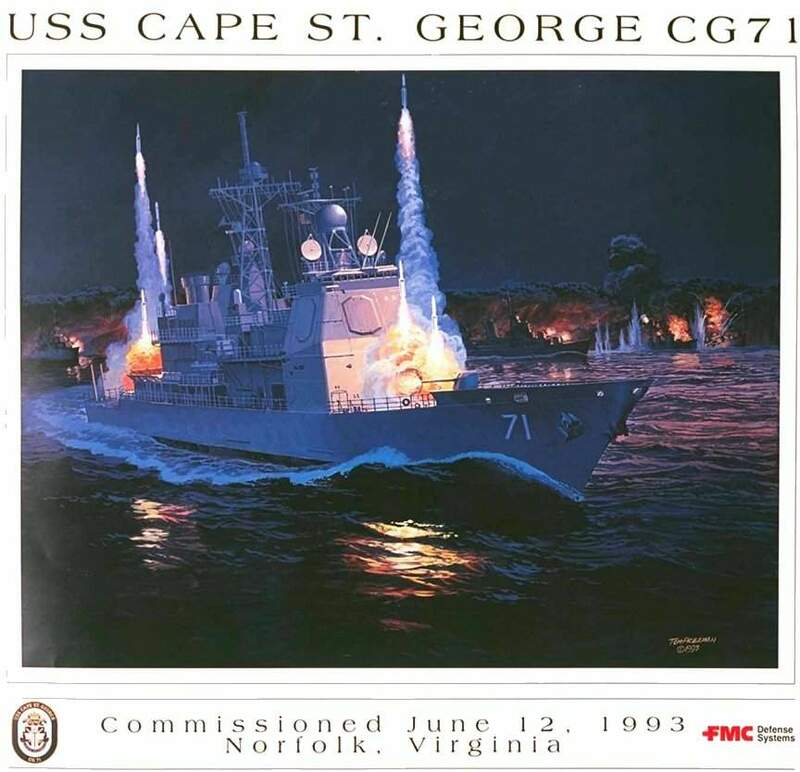 Click here to see which USS CAPE ST. GEORGE memorabilia are currently for sale on ebay. The shield contains the azure and gold colors traditionally associated with the Navy, while the cross refers to St. George. The trident symbolizes Naval power and CAPE ST. GEORGE's capability to fight above, on and below the sea. It is surmounted by three Indian arrows which recall the nickname "Little Beavers" by which DESRON 23 became known. These arrows symbolize the three Japanese ships sunk during the battle. 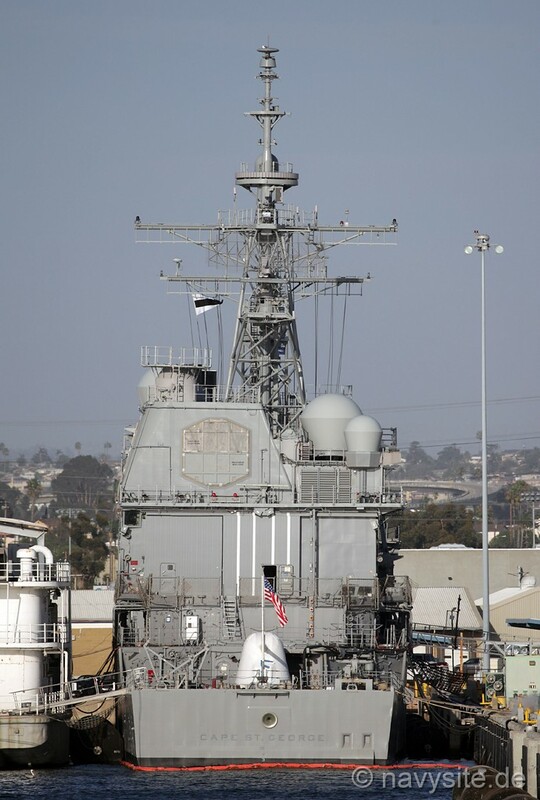 Emblazoned with a torpedo, the weapon employed so effectively by the Little Beavers during the battle, and a Tomahawk cruise missile, the shield reflects the weapons of the past and present. The crest's gold star, the modern symbol of command at sea, reflects the inspirational leadership and professionalism of the officers who commanded the Little Beavers at Cape St. George. 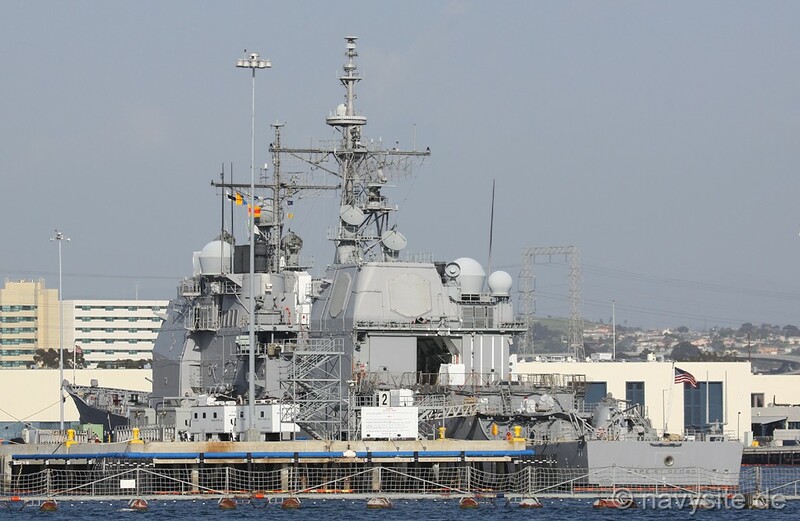 A stylized black demi-array, which recalls the nighttime engagement and represents the capabilities of the AEGIS Weapons System, serves as the background for a dragon, symbolizing Japan and also recalling St. George. The crossed enlisted cutlass and officers sword signify the strength, readiness, and teamwork necessary to achieve victory, and the professionalism of today's Surface Warriors. They are intertwined in a ribbon in the colors of the Presidential Unit Citation awarded to Arleigh Burke's Little Beavers. Silver and gold symbolize integrity and excellence. USS CAPE ST. GEORGE commemorates the battle fought in the South Pacific off the island of New Ireland in the Bismarck Archipelago on 25 November 1943. Naval intelligence suspected that the Japanese would attempt to resupply or evacuate their forces on Bougainville and Buka Islands to their base at Rabaul. Anticipating their move, Admiral William "Bull" Halsey gave Captain (later Admiral) Arleigh Burke, the Commander of DESRON 23, the following orders: "Thirty-One Knot Burke, get athwart the Buka-Rabaul evacuation line...if enemy contacted, you know what to do. "During this early morning action, five destroyers of DESRON 23, the Little Beavers, sank three of five Japanese destroyers involved in the engagement, and severely damaged a fourth, without damage to any of Burke's ships. Click here to read a detailed history of the Battle of Cape St. George. 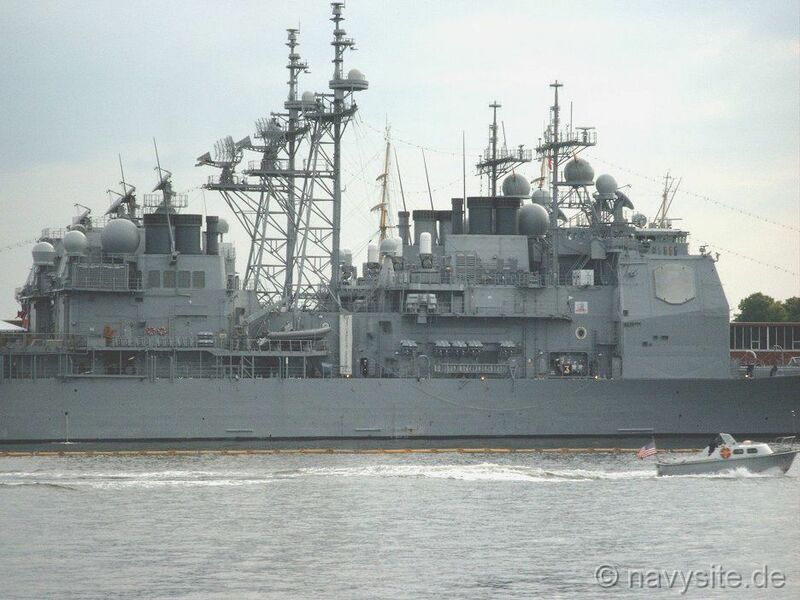 USS CAPE ST. GEORGE�s keel was laid on November 10, 1990, and she was launched on January 10, 1992. 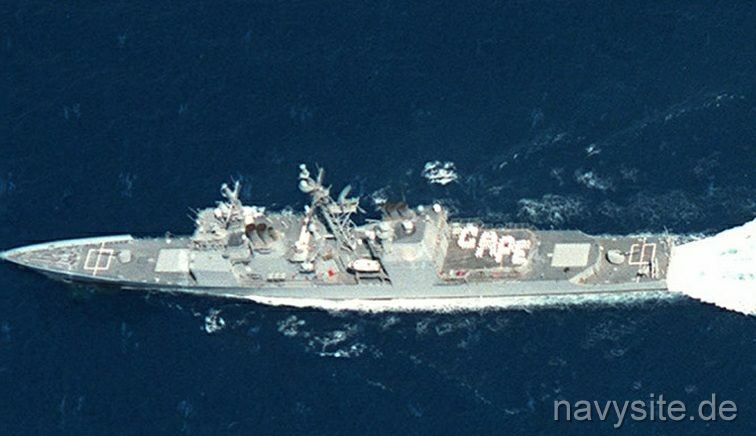 CAPE ST. GEORGE was christened on April 11, 1992 by her sponsor, Mrs. Doris Hekman, the wife of VADM Peter M. Hekman, Jr., USN (Ret.). 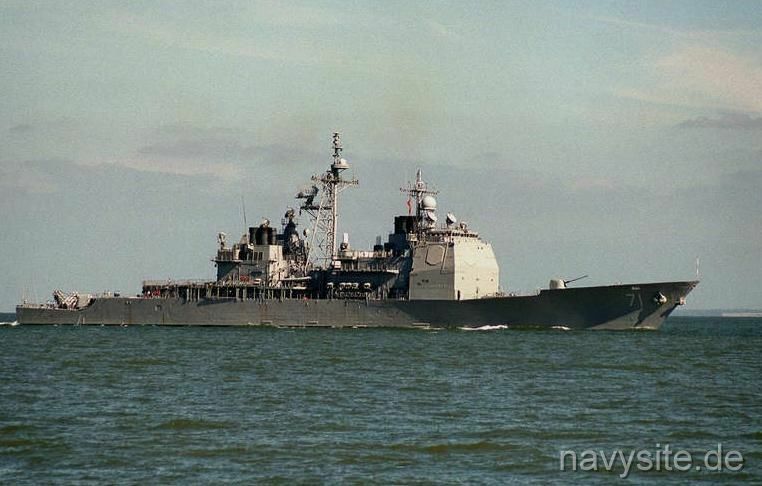 After commissioning on June 12, 1993 at ceremonies in Norfolk, Virginia, CAPE ST. GEORGE joined the Atlantic Fleet, completed work-ups with the USS DWIGHT D. EISENHOWER Battle Group, and departed on her maiden deployment on October 21, 1994. 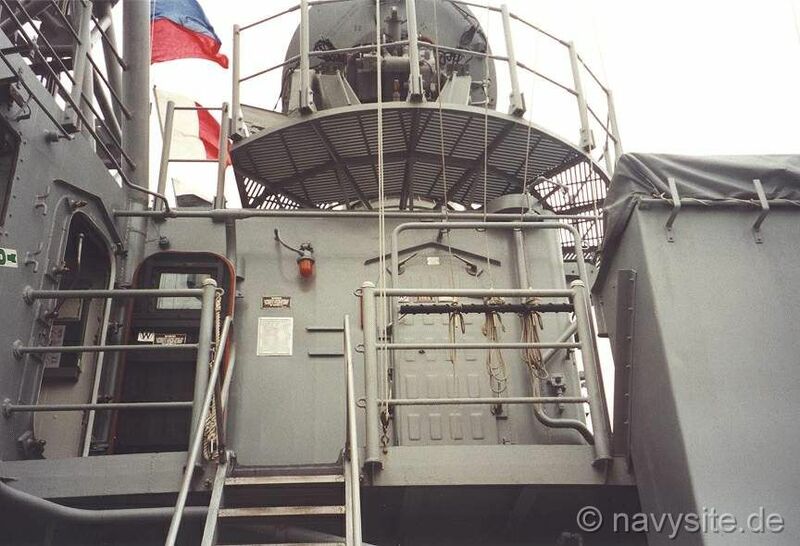 During her first deployment, CAPE ST. GEORGE participated in Operations SHARP GUARD and DENY FLIGHT enforcing United Nations sanctions over Bosnia, as well as numerous complex exercises. Shortly after returning from deployment, CAPE ST. GEORGE conducted Counter-Narcotics Operations, during which she intercepted and seized a vessel carrying over 12.5 tons of cocaine, the largest such seizure in maritime history. In August and September 1995, CAPE ST. GEORGE participated in the first All-Service Combat Identification and Evaluation Team (ASCIET) exercise, a joint warfighting laboratory focused on improving combat identification among all branches of the Armed Forces. The perennial cornerstone of the exercise, CAPE ST. GEORGE again participated in ASCIET in 1996 and 1997. 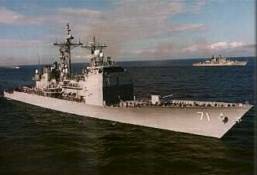 In January 1996, the ship transited the Panama Canal to participate in Exercise MOUNTAIN TOP, a major developmental test of the Cooperative Engagement Capability (CEC), conducted at the Pacific Missile Test Range off Hawaii. 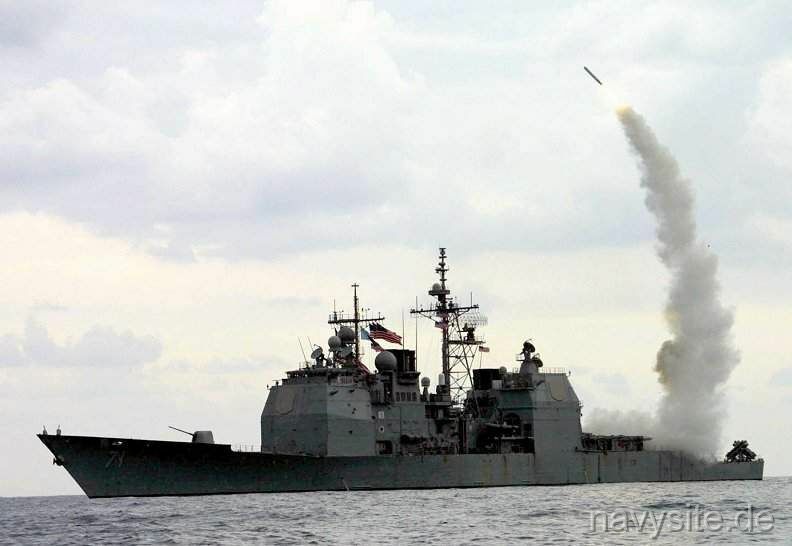 Following ASCIET �96, the ship participated in a highly successful missile-firing exercise in support of CEC development and achieved Initial Operational Capability (IOC) of CEC. 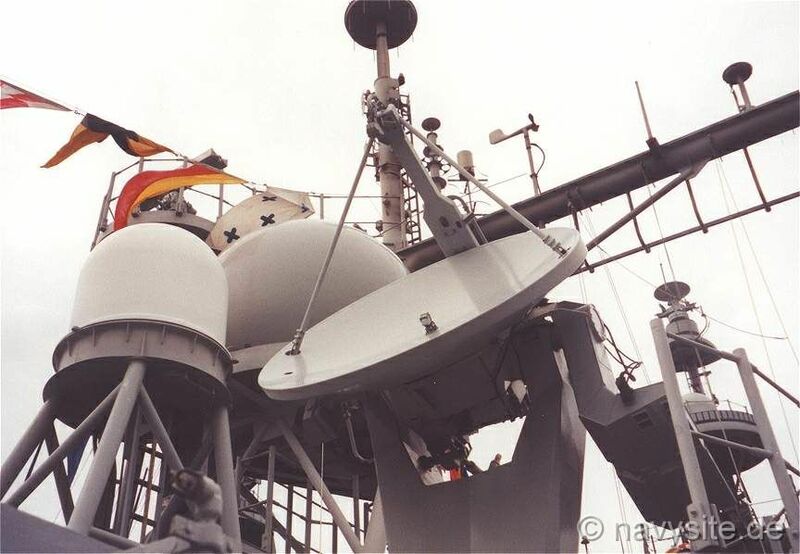 In the summer of 1997, CAPE ST. GEORGE deployed to the Baltic Sea for U.S. 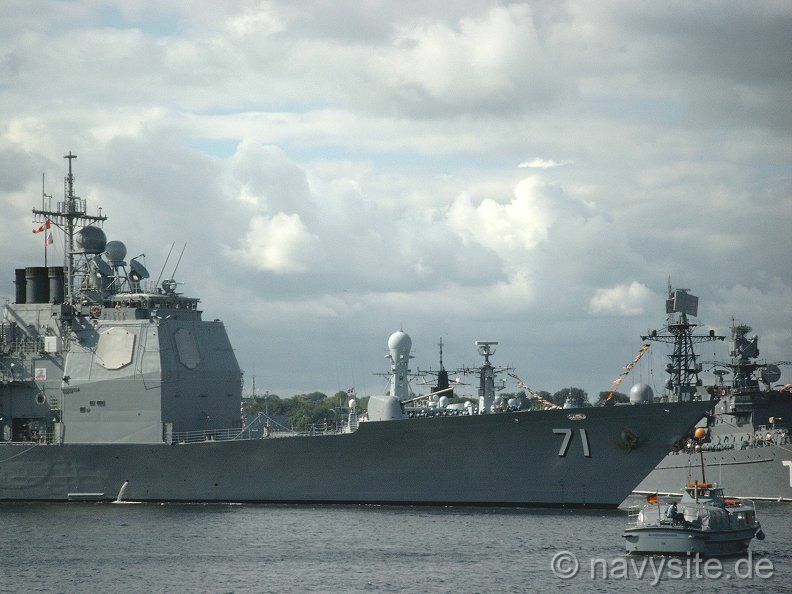 Exercise Baltic Operations (BALTOPS) �97. 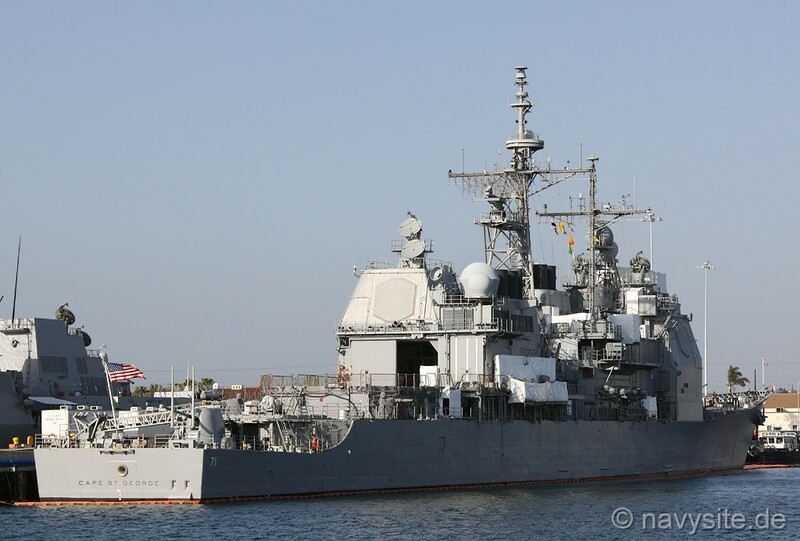 A major annual regional maritime and defense exercise, BALTOPS �97 drew participants from thirteen nations and over fifty ships, aircraft, and submarines. 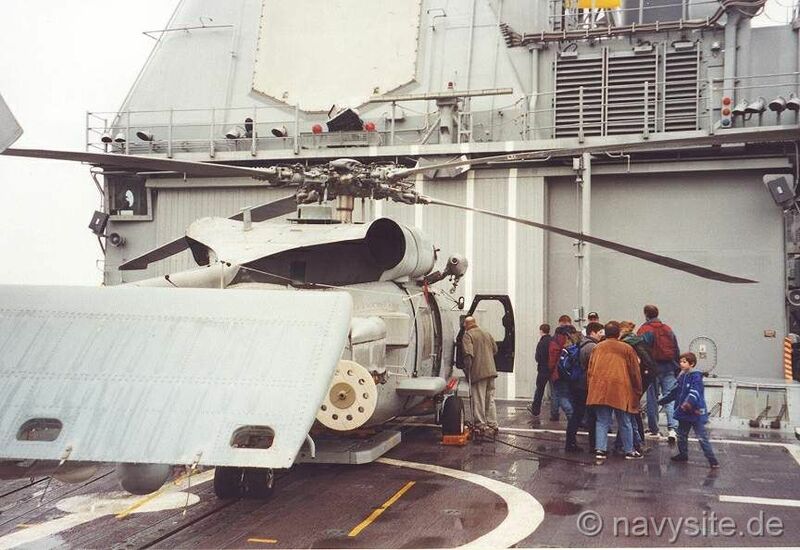 During BALTOPS, CAPE ST. GEORGE embarked a British Royal Navy SEA LYNX helicopter detachment, a first for a U.S. Navy ship. 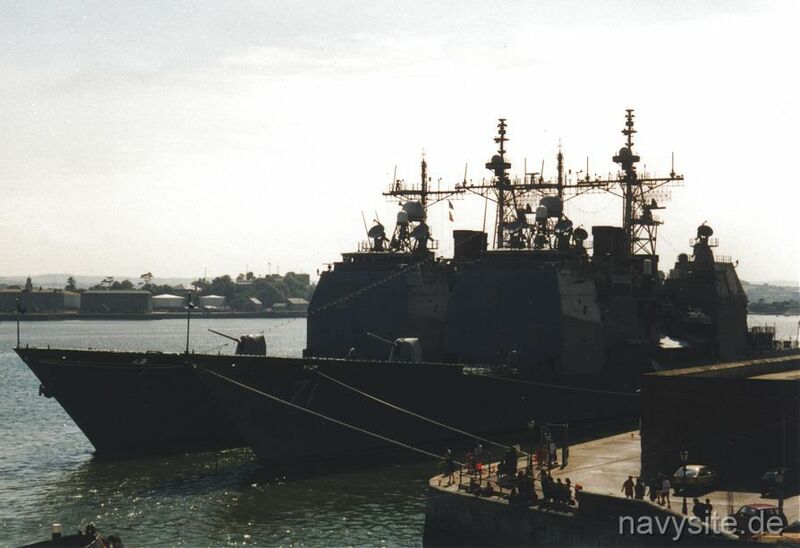 After work-ups, CAPE ST. GEORGE departed for her second deployment on June 10, 1998. As EISENHOWER Battle Group Air Defense Commander, CAPE ST. GEORGE was responsible for the theater air and missile defense of the battle group. 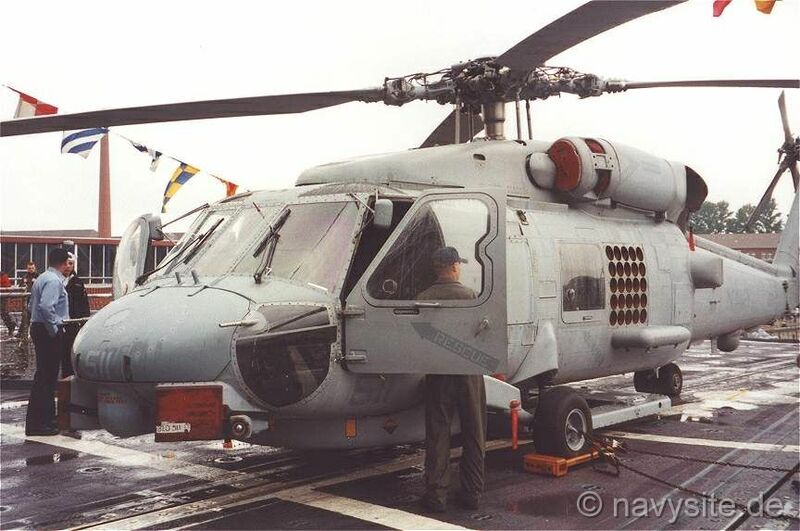 CAPE ST. GEORGE spent the first half of the deployment in the Mediterranean Sea and participated in Operation DELIBERATE FORGE, enforcing the no-fly zone over Bosnia and serving as Adriatic Sea "Redcrown." 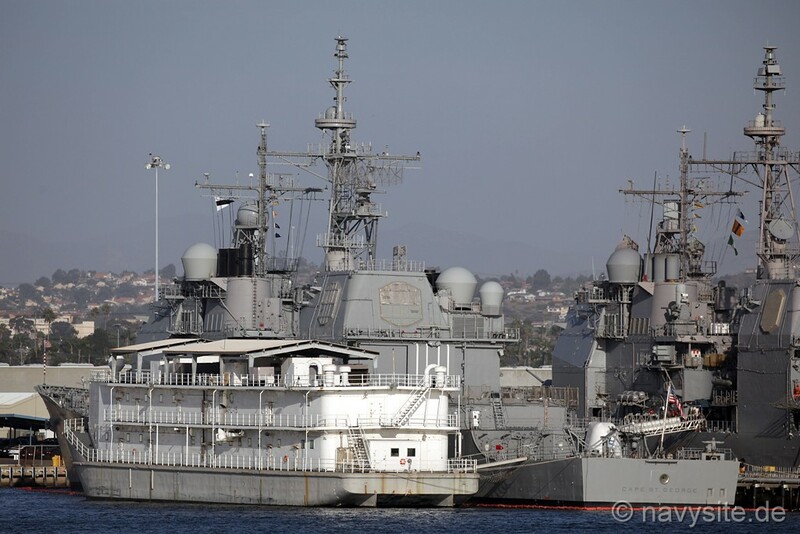 While in the Mediterranean, CAPE ST. GEORGE also participated in several joint and multinational exercises, including SHAREM 125, MATADOR 98, and EAGLE ARENA. She also conducted Freedom of Navigation operations. On 26 June 1998, with the USS DWIGHT D. EISENHOWER Carrier Battle Group, USS CAPE ST. GEORGE conducted a routine, previously scheduled deployment to the Mediterranean and Black Seas. It was her second deployement. 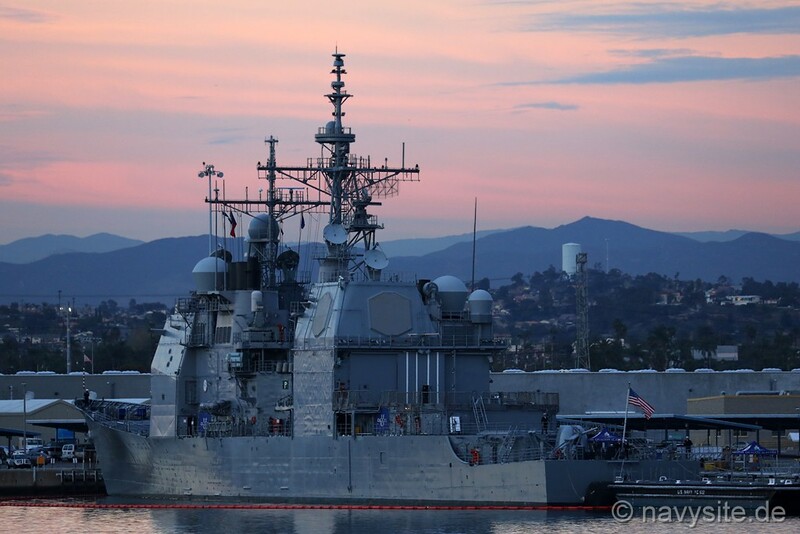 The DWIGHT D. EISENHOWER Battle Group arrived in the Mediterranean on June 20. As DWIGHT D. EISENHOWER Battle Group Air Defense Commander, CAPE ST. GEORGE was responsible for the theater air and missile defense of the battle group. Units of the DWIGHT D. EISENHOWER Battle Group participated in 14 exercises during their deployment to the European Theater of operations, including several NATO and multinational exercises throughout the Mediterranean and Black Seas. While deployed to the Mediterranean in the summer of 1998, the CAPE ST. GEORGE operated in the Adriatic Sea with the USS DWIGHT D. EISENHOWER (CVN 69) in support of the multinational operation Deliberate Forge and NATO's Operation Joint Forge. 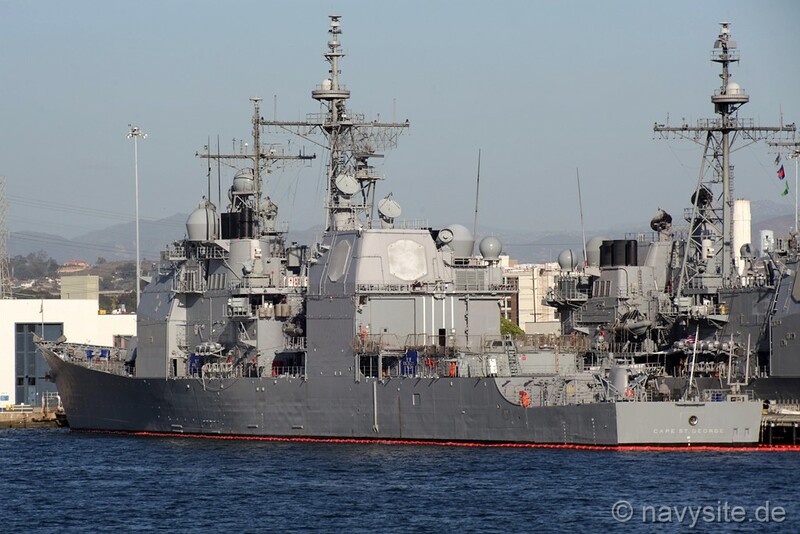 The USS CAPE ST. GEORGE served as Fleet Air Defense Identification Zone coordinator and established a CEC network with DWIGHT D. EISENHOWER and USS ANZIO, and served as Adriatic Sea "Redcrown". CEC enabled the three ships to maintain a flawless single integrated air picture within the Adriatic Sea. While in the Mediterranean, CAPE ST. GEORGE also participated in several joint and multinational exercises, including SHAREM 125, MATADOR 98, and EAGLE ARENA. 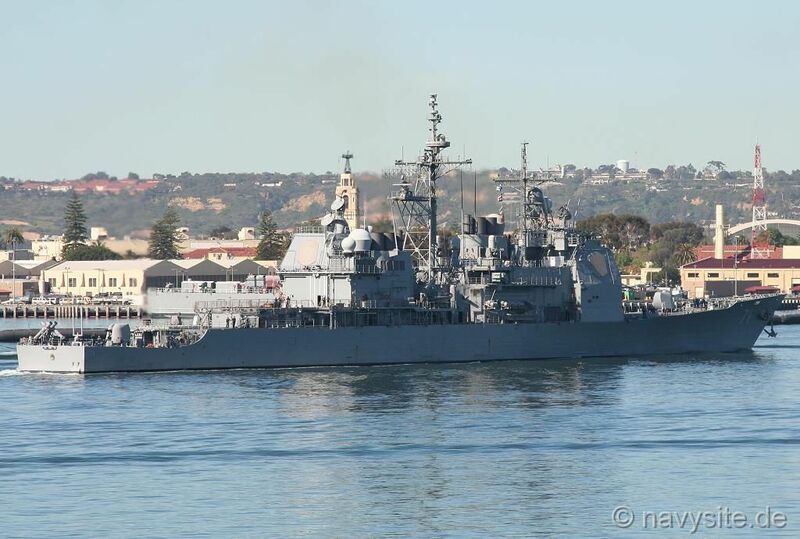 She also conducted Freedom of Navigation operations. 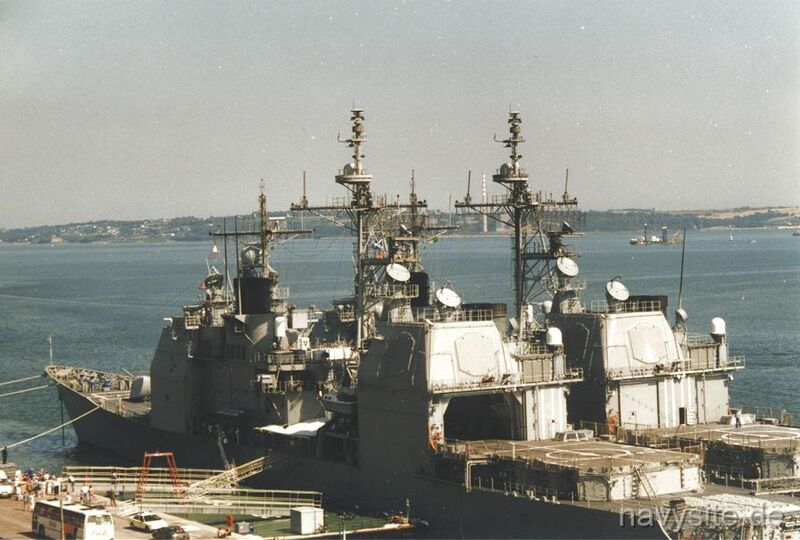 CAPE ST. GEORGE made her first transit of the Suez Canal on August 31, 1998, enroute to the Arabian Gulf. While deployed to the Arabian Gulf, CAPE ST. GEORGE participated in Operation SOUTHERN WATCH. As part of the USS DWIGHT D. EISENHOWER battle group, USS CAPE ST. GEORGE participated in a series of increasingly demanding exercises and operations. The training culminated in Joint Task Force Exercise 00-1 held in December 1999. 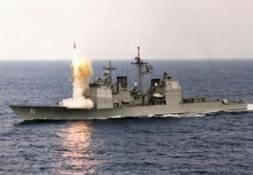 However, because it was unable to complete live-fire training with ground spotters, and thus complete training prior to deploying on February 18, 2000, USS CAPE ST. GEORGE had to perform its Naval Surface Fire Support training at the Cape Wrath, Scotland training range. This came as a result of the Navy training range at Vieques, Puerto Rico, being closed since April. The use of the range at Cape Wrath was a unique circumstance demonstrating cooperation with British allies who operate the range. 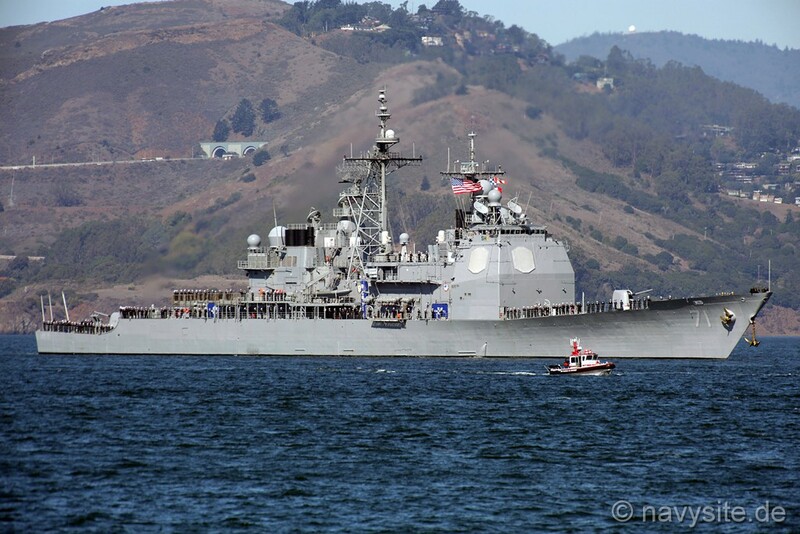 Working through heavy seas and high winds, USS CAPE ST. GEORGE, as well as USS ANZIO (CG 68) and USS MAHAN (DDG 72) were able to complete their training and attain certification in naval surface fire support. The training at Cape Wrath was performed with ground spotters for directing fire. However, the training lacked the coordinated live-fire exercises with Marines ashore, which is a hallmark of the training received at the Navy's Atlantic Fleet Weapons Training Facility range on Vieques. 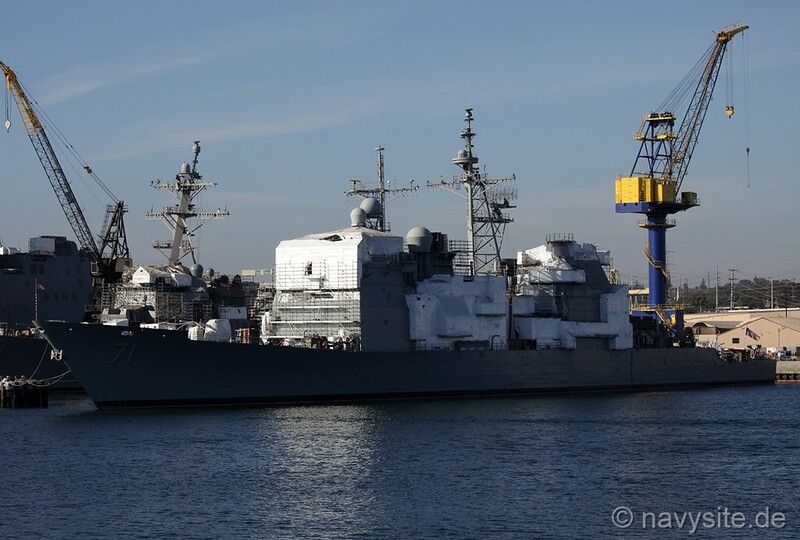 Upon completion, CAPE ST. GEORGE immediately headed for her duties in the Mediterranean and 6th Fleet Area of Operation. The ship made port calls to Cartagena, Spain and Limassol, Cyprus. 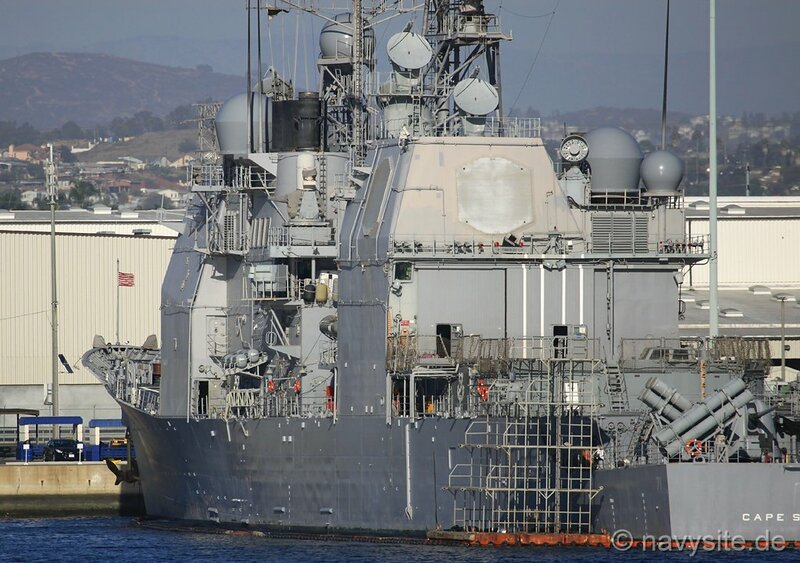 After Limassol, the ship conducted Exercise Juniper Stallion and Fleet Battle Experiment-Golf in the eastern Mediterranean with the DWIGHT D. EISENHOWER following which, she transited to one of Greece�s most remote vacationing spots, the island of Mykonos. 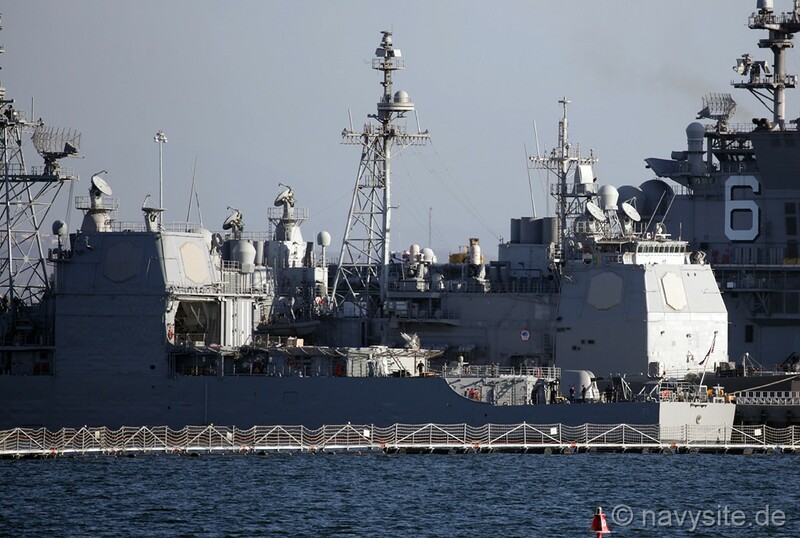 Following Greece, CAPE ST. GEORGE returned to the Eastern Mediterranean where she continued Fleet Battle Experiment-Golf and later visited Haifa, Israel along with the USS DWIGHT D. EISENHOWER. 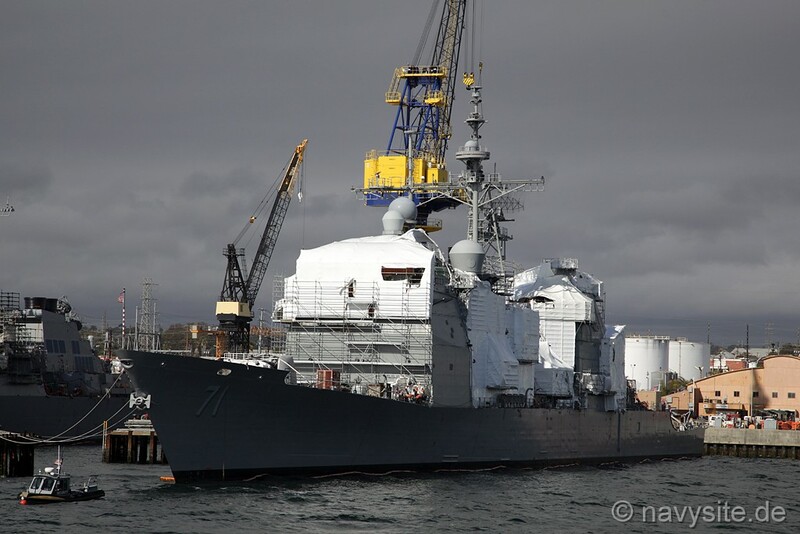 After Haifa, CAPE ST. GEORGE transited to La Maddalena, Sardinia where she underwent her first ever deployment Fleet Maintenance Availability. During her seven days in La Maddalena, CAPE ST. GEORGE got a lot of much needed repairs completed. Leaving La Maddalena, CAPE ST. GEORGE headed for Rijeka, Croatia where she was the first cruiser to ever visit Croatia and the first U.S. warship to visit the city since its independence from Yugoslavia. 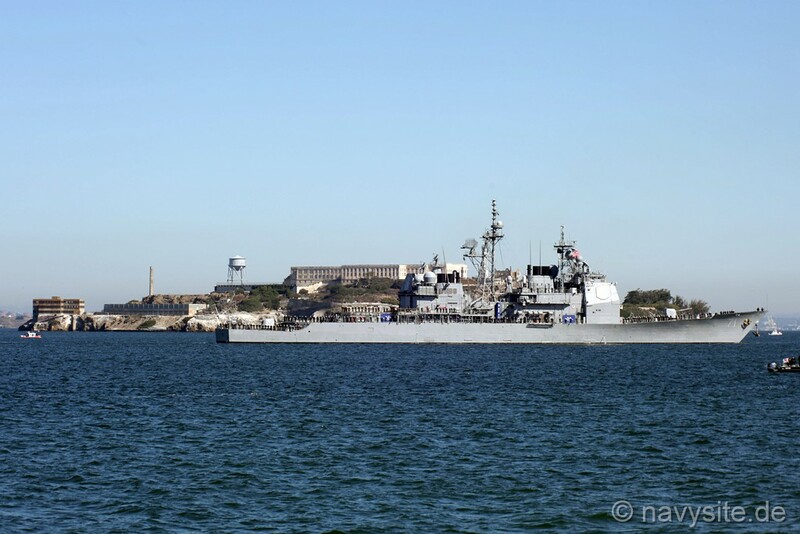 The city had been anxiously waiting to host a United States Navy ship since her independence in 1991 and, as a result, daily stories were run in the local and national press, including radio and television spots. Departing Croatia, CAPE ST. GEORGE again joined with USS DWIGHT D. EISENHOWER as she got underway from her Croatian port visit in Dubrovnik. Transiting together, CAPE ST. GEORGE split from the carrier and headed to her second port visit to Limassol, as the final port visit before heading to the Arabian Gulf. 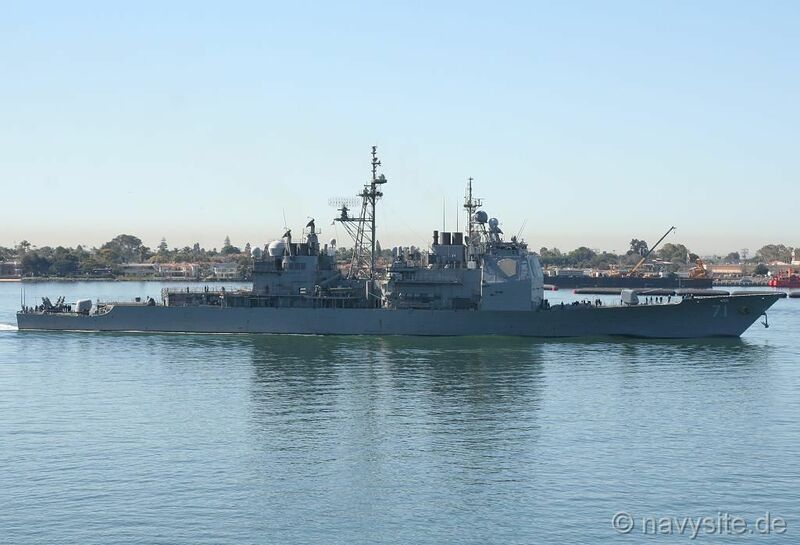 On May 20, CAPE ST. GEORGE transited the Suez Canal and joined Fifth Fleet in the Arabian Gulf. 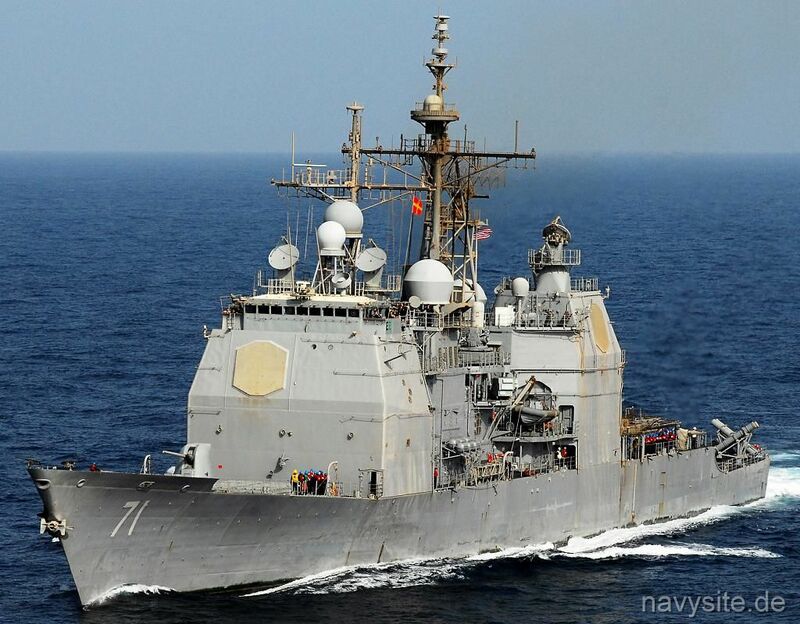 In the Gulf, the ship participated in Operation SOUTHERN WATCH and Maritime Interception Operations (MIO). CAPE ST. GEORGE also conducted MIO in support of United Nations Security Council Resolution 986 as part of a multi-national force enforcing economic sanctions against Iraq. While in the Arabian Gulf, CAPE ST. GEORGE made several port visits to Mina Salman, Bahrain; and Dubai, U.A.E, twice. After her second port visit in Dubai, CAPE ST. GEORGE left the Gulf on 19 July, and transited the Suez Canal northbound on 28 July. Returning to the Mediterranean after two months of Arabian Gulf operations, CAPE ST. GEORGE made a final port visit in Benidorm, Spain. 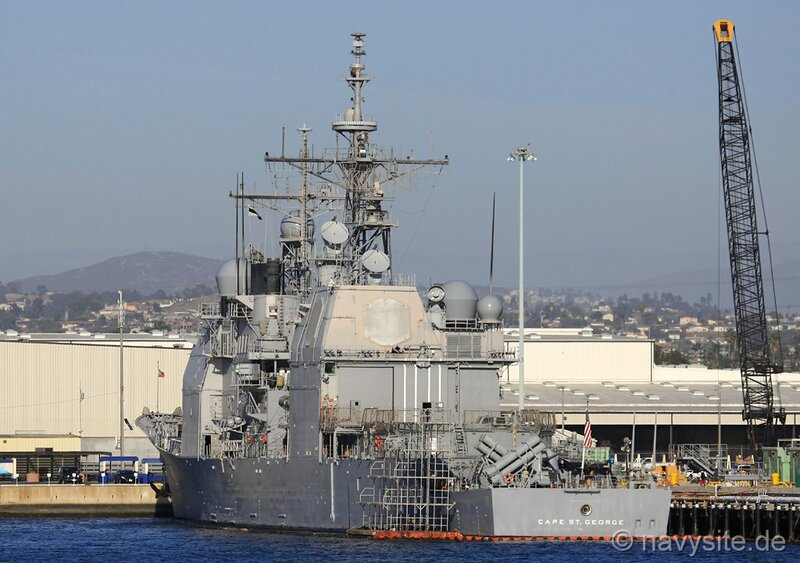 On August 8, she left the Mediterranean and met up with the rest of the DWIGHT D. EISENHOWER Battle Group to transit the Atlantic to Newport, Rhode Island. 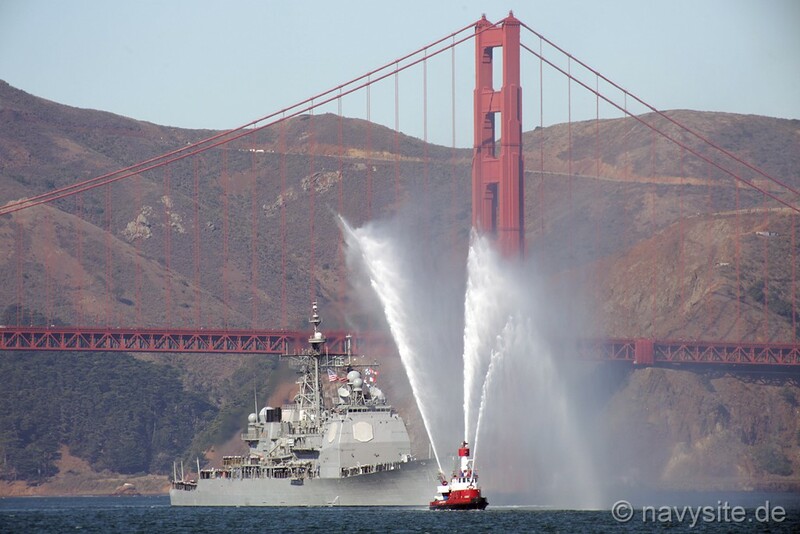 USS CAPE ST. GEORGE returned home from her six-month deployment on 18 August 2000. 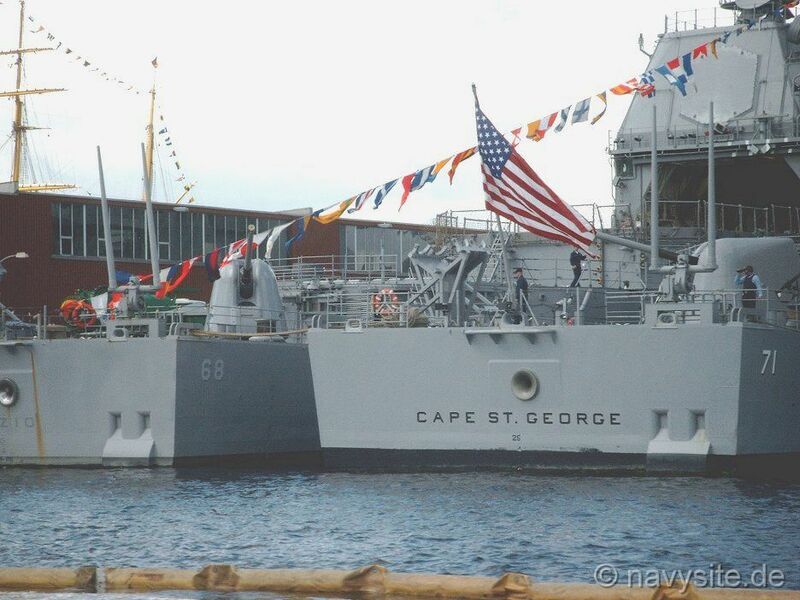 USS CAPE ST. GEORGE took part in late September 2000 in Underway No. 10", one in a series of tests leading to the Cooperative Engagement Capability (CEC) Operation Evaluation (OPEVAL) scheduled for Spring 2001. 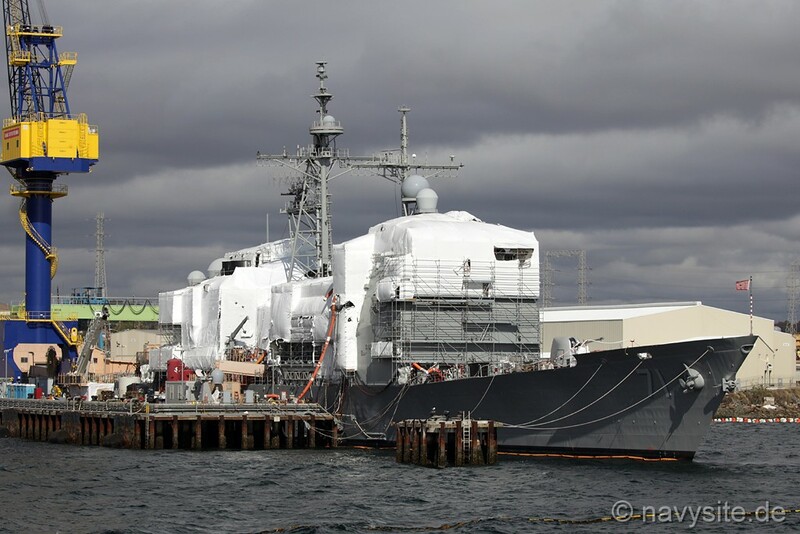 The CEC system provides the capability to cooperatively engage targets by a warship using data from other CEC-equipped ships, aircraft, and land-based sensors, even in an electronic-jamming environment. It also provides a common, consistent and highly accurate air picture, allowing battle group defenses to act as one seamless system. 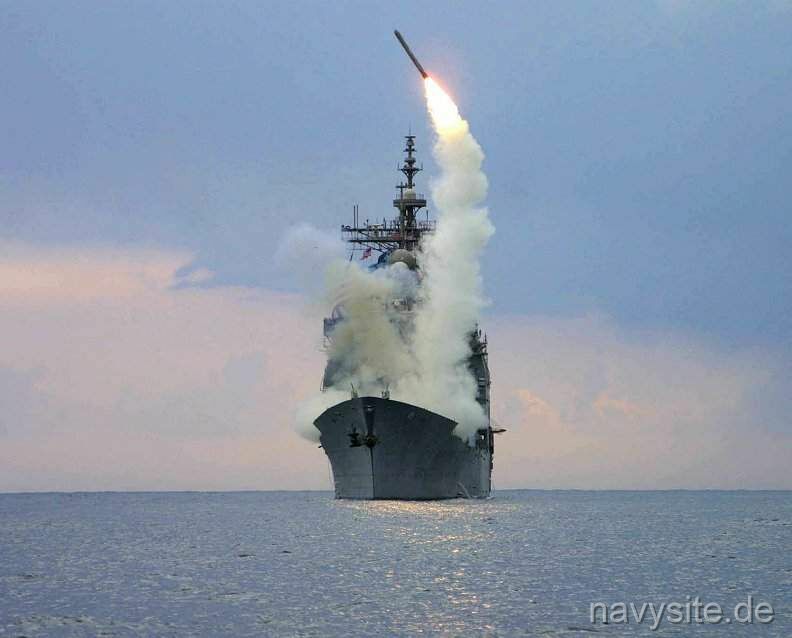 The test, off Wallops Island, VA, simulated missile firings from some of the Navy's most technically advanced ships against unmanned drones. 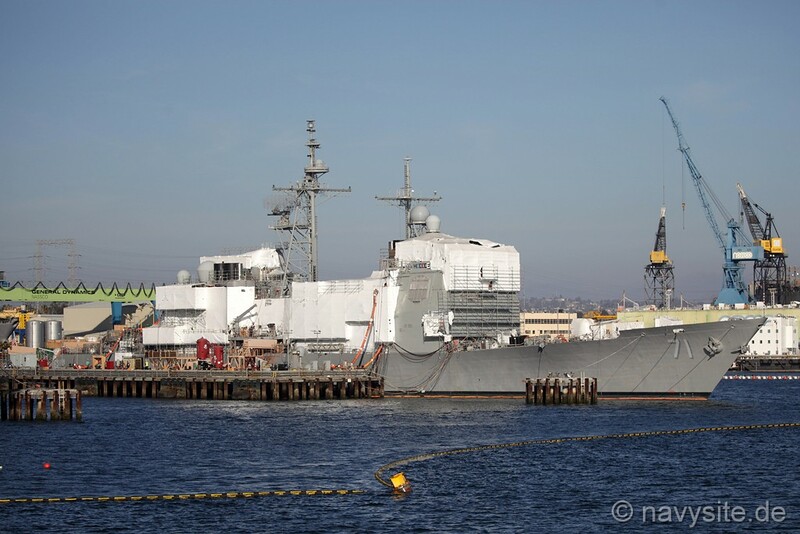 USS CAPE ST. GEORGE left its homeport of Norfolk, VA, on May 21, and took part, in the Baltic Sea, in the 29th annual maritime exercise Baltic Operations (BALTOPS) 2001. With naval vessels and over 40 aircraft of 14 nations taking part, the exercise is intended to improve interoperability with Baltic Sea nations and Partnership for Peace countries by conducting a peace support operation at sea. The operation involved exercises in gunnery, replenishment-at-sea, undersea warfare, radar tracking, mine countermeasures, seamanship, search and rescue, and maritime interdiction operations. Additionally, the nations conducted personnel exchanges amongst the ships so that officers and sailors could see how their contemporaries from other navies live and operate. 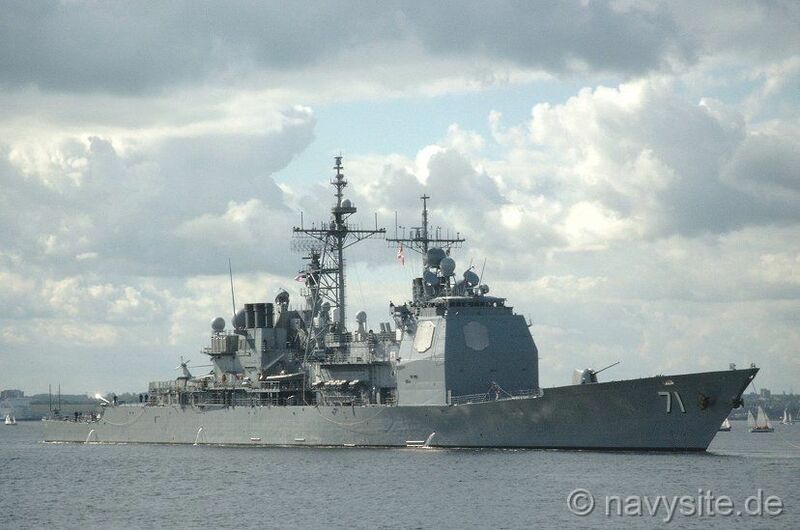 In the summer of 2002, CAPE ST. GEORGE again returned to the Baltic Sea for BALTOPS 2002. In late January 2003, CAPE ST. GEORGE participated in the Composite Training Unit Exercise (COMPTUEX) of the USS THEODORE ROOSEVELT (CVN 71) Battle Group in the Puerto Rican Operating Area. 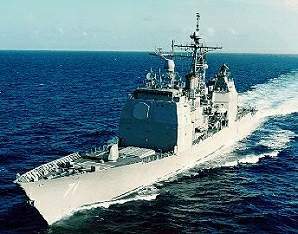 On February 4, 2003, the Battle Group, including CAPE ST. GEORGE, left the Caribbean and deployed to the Mediterranean in support of Operation Enduring Freedom. From March 20 on, the Battle Group participated in Operation Iraqi Freedom, the war against the regime of Saddam Hussein. CAPE ST. GEORGE acted as platform for Tomahawk strikes against targets in Iraq. CAPE ST. GEORGE has been awarded five Battle Efficiency awards and was the 1995 winner of the USS ARIZONA Memorial Trophy Award, given by the Chief of Naval Operations to that ship in the U.S. Navy with the highest combat readiness over a two year period. She has also been awarded a Joint Meritorious Unit Commendation, Meritorious Unit Commendation, the National Defense Service Medal, Armed Forces Expeditionary Medal, Armed Forces Service Medal, and the Sea Service Ribbon (gold star in lieu of second award). 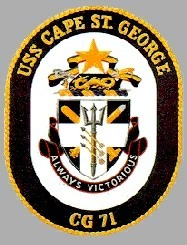 During her maiden deployment, CAPE ST. GEORGE was awarded the Commander, SIXTH Fleet "Hook �Em" award for Anti-Submarine Warfare excellence. 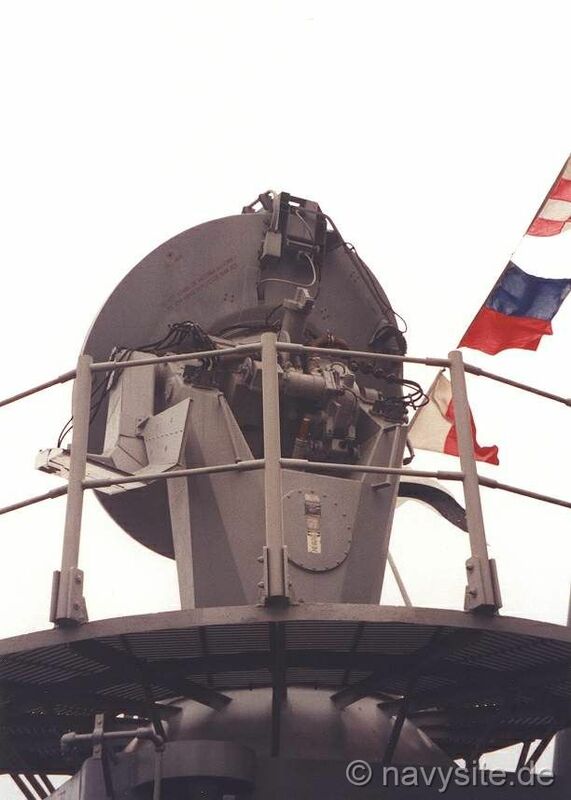 While conducting work-ups for her 1998 deployment, CAPE ST. GEORGE achieved a perfect gunnery score at the Atlantic Fleet Weapons Testing Facility (AFWTF) in Puerto Rico, earning her second James F. Chezek Memorial Gunnery Award. 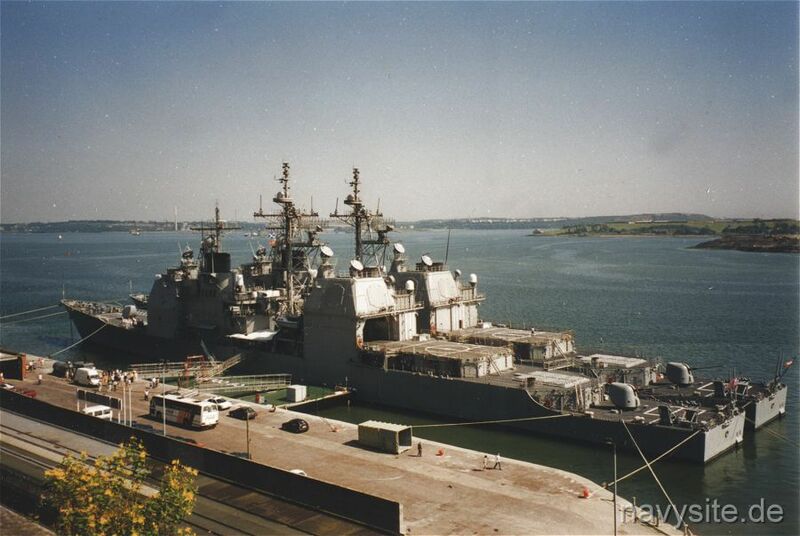 The photos below were taken by Martin Engelhardt and show CAPE ST. GEORGE (foreground) and USS ANZIO (CG 68) during a port visit to Cobh, Ireland, in 1996. 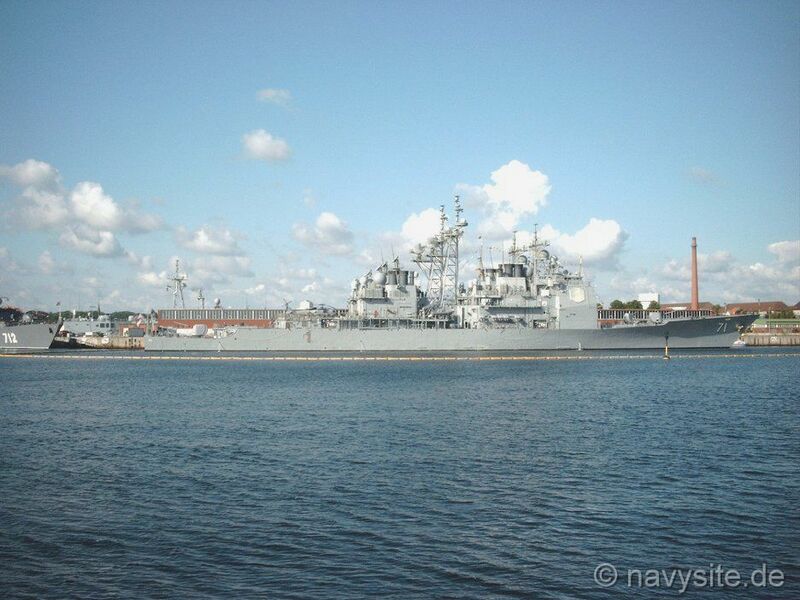 The photos below were taken by me during CAPE ST. GEORGE's port visit to Kiel on June 16, 2001, at the end of BALTOPS 2001. 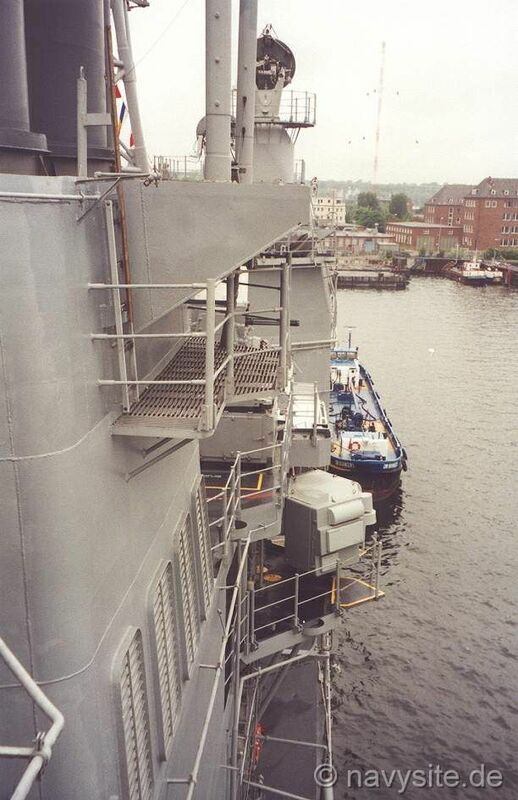 The photos below were taken by me during CAPE ST. GEORGE's port visit to Kiel, Germany, from June 21 - 24, 2002. 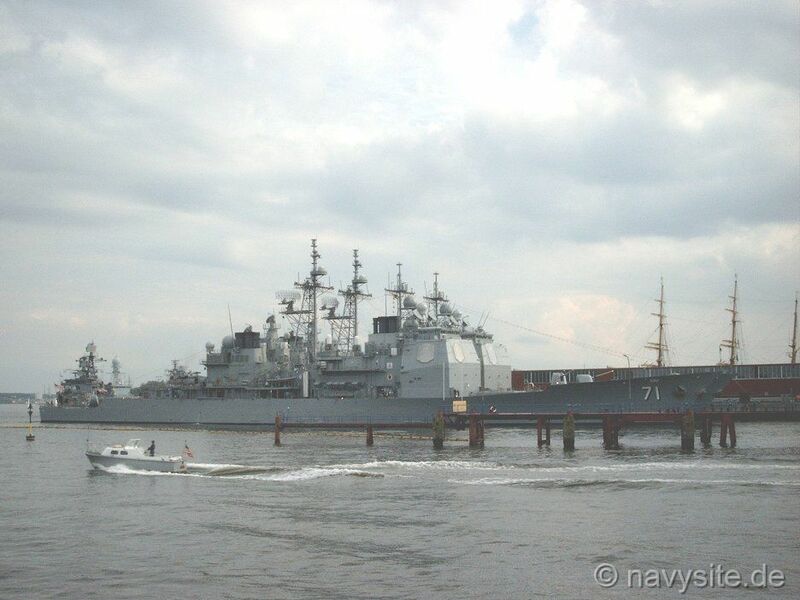 The port visit marked the end of BALTOPS 2002. 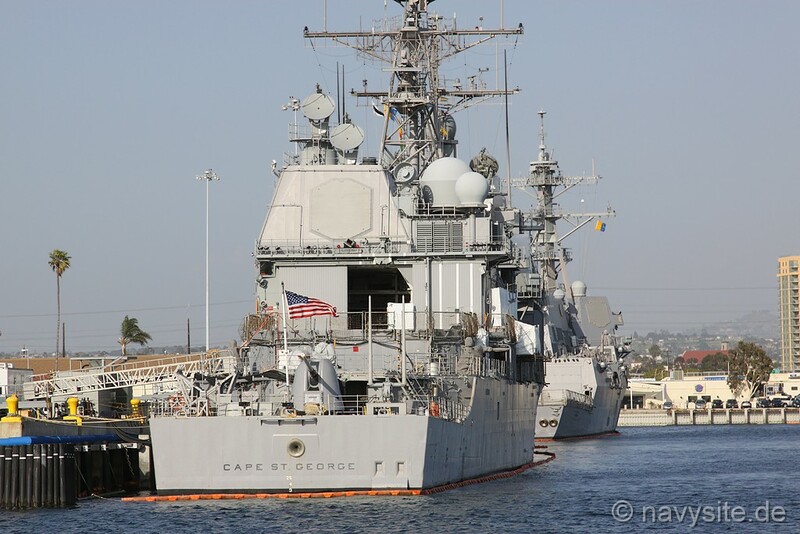 The photos below were taken by me and show the CAPE ST. GEORGE departing Naval Base San Diego, Calif., on March 10, 2008. 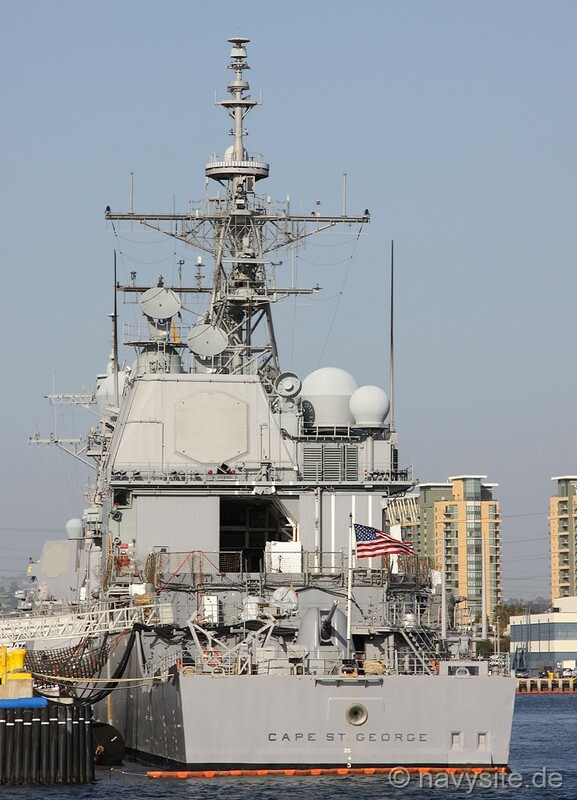 The photos below were taken by me and show the CAPE ST. GEORGE at Naval Base San Diego, Calif., on March 23, 2010. 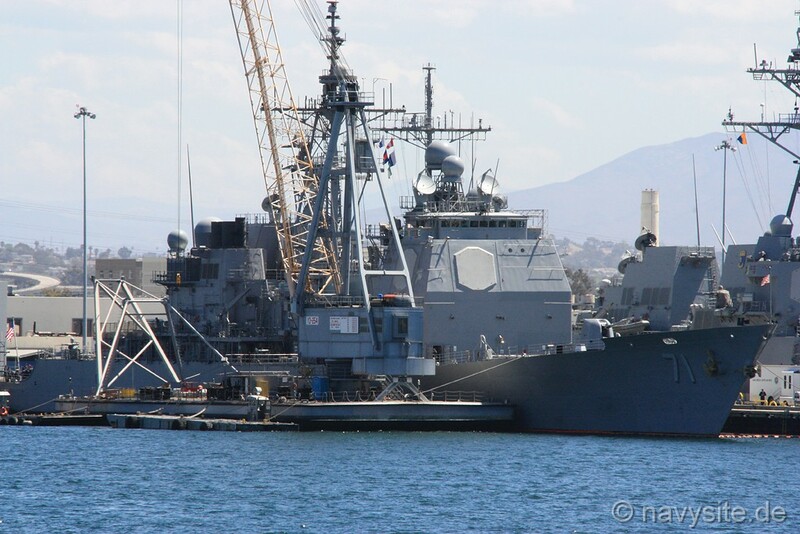 The photos below were taken by me and show the CAPE ST. GEORGE at Naval Base San Diego, Calif., on October 3, 2012. 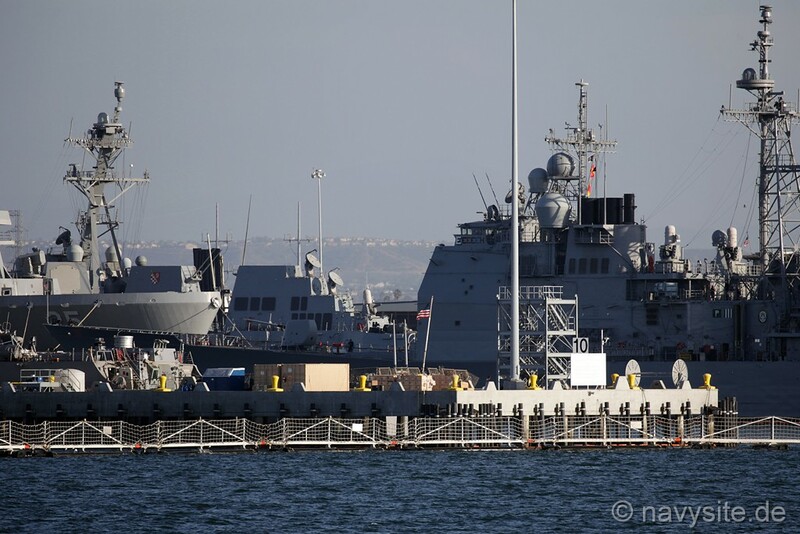 The photo below was taken by Henry Schnutz and shows the CAPE ST. GEORGE at Naval Base San Diego, Calif., on August 27, 2013. 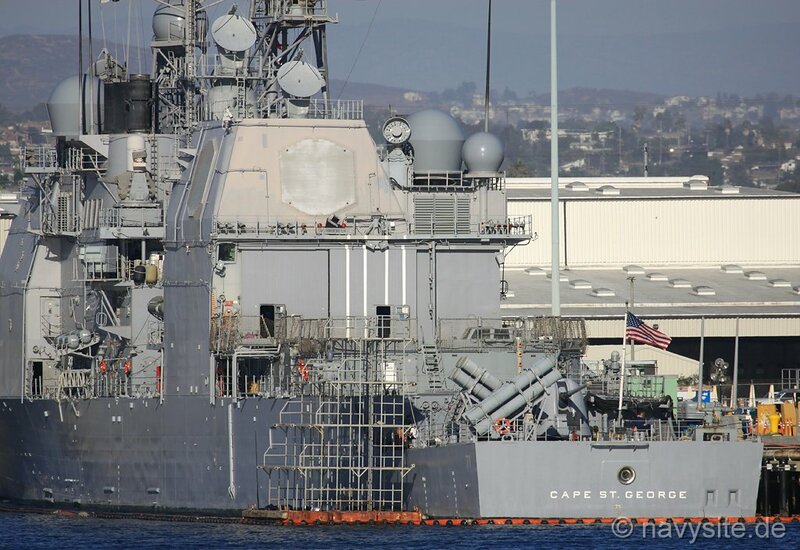 The photo below was taken by Michael Jenning and shows the CAPE ST. GEORGE at Naval Base San Diego, Calif., on October 2, 2015. 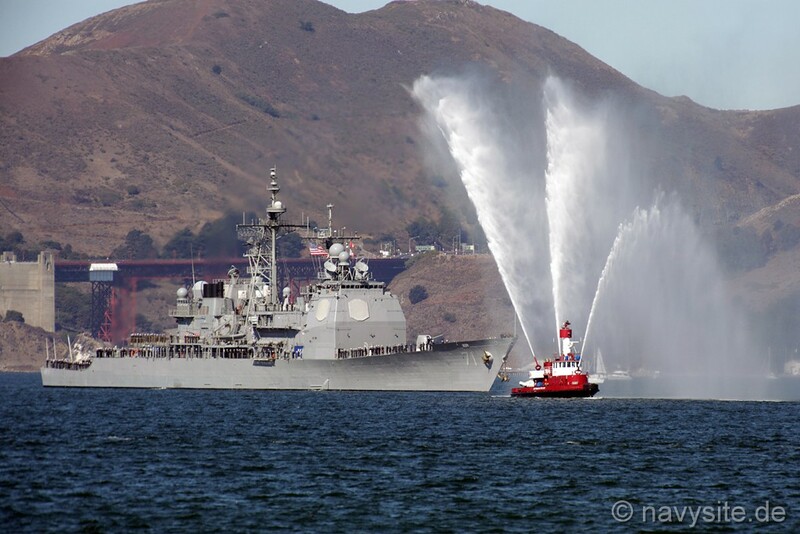 The photos below were taken by Michael Jenning and show the CAPE ST. GEORGE participating in the Parade of Ships during Fleet Week San Francisco on October 9, 2015. 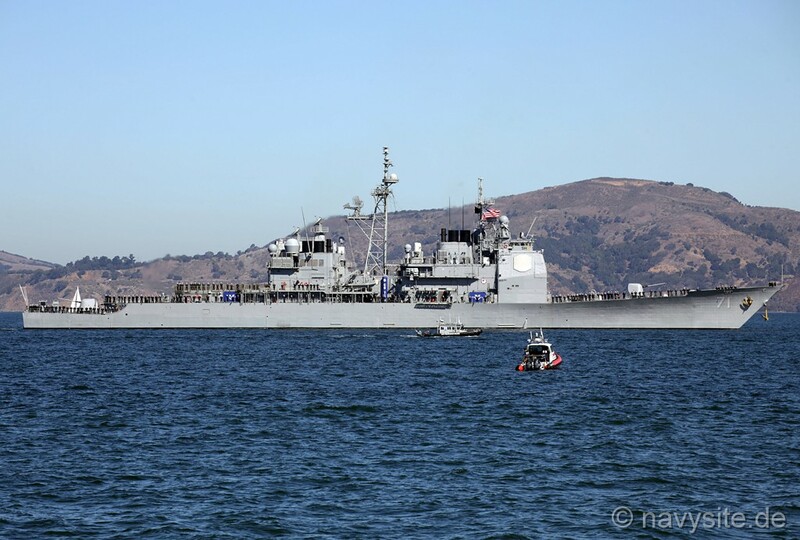 The photos below were taken by Michael Jenning on October 10, 2015, during an open house aboard USS CAPE ST. GEORGE as part of Fleet Week San Francisco. 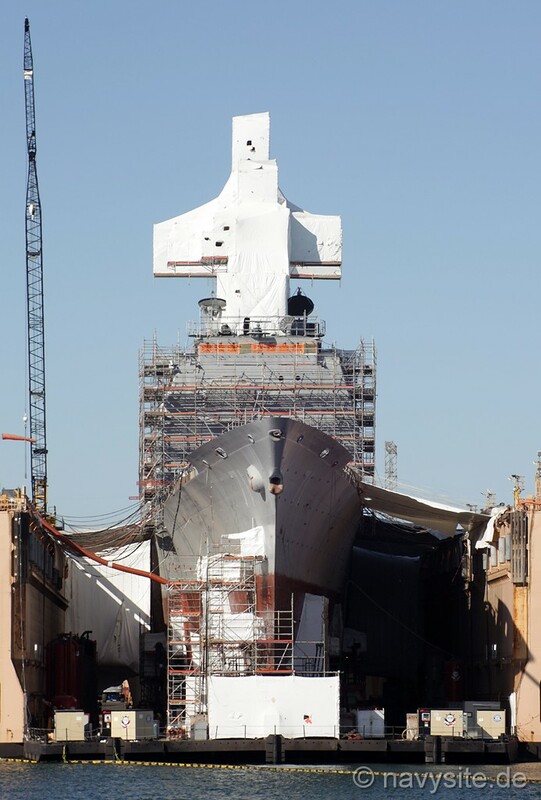 The photos below were taken by Michael Jenning and show the CAPE ST. GEORGE at BAE Systems San Diego Ship Repair, San Diego, Calif., undergoing an Extended Drydocking Selected Restricted Availability (E-DSRA) on April 18, 2016. 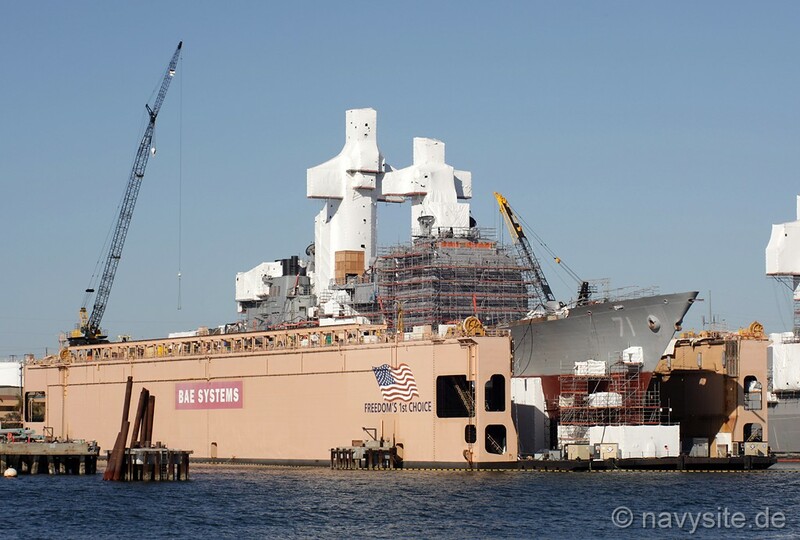 The photos below were taken by Michael Jenning and show the CAPE ST. GEORGE at Naval Base San Diego, Calif., on October 6, 2016. 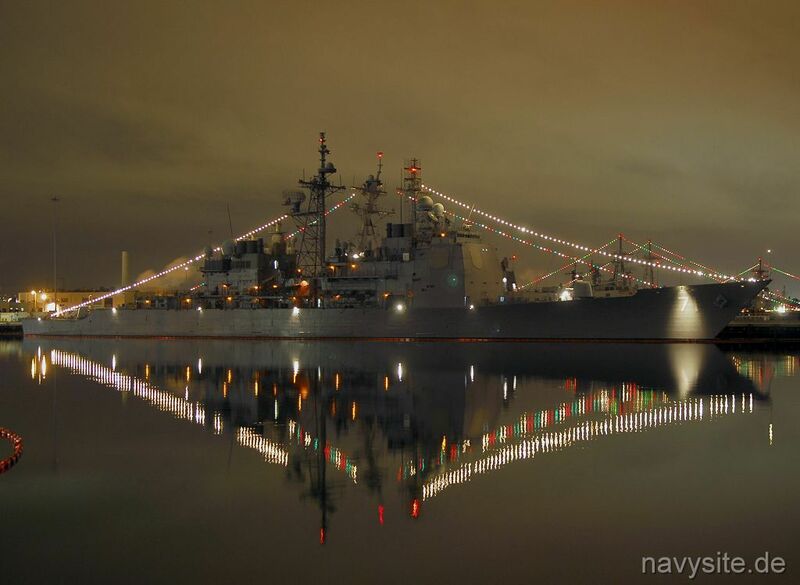 The photo below was taken by Sebastian Thoma and shows the CAPE ST. GEORGE at Naval Base San Diego, Calif., on December 20, 2016. 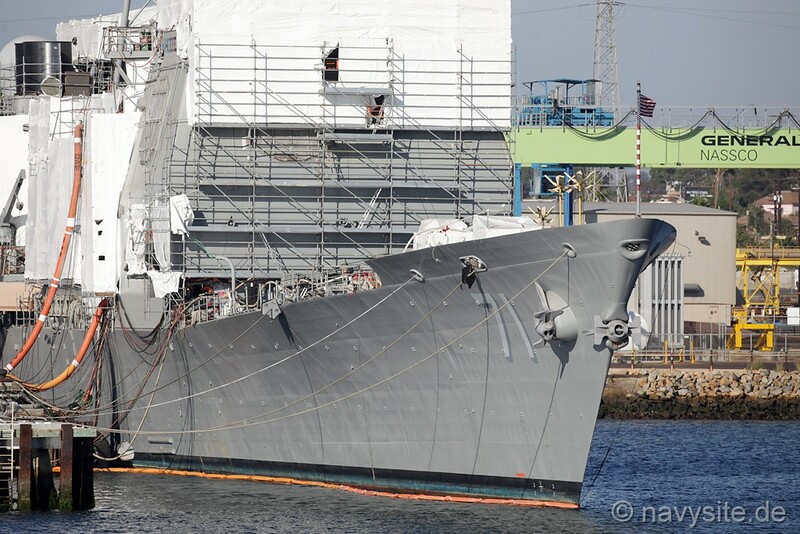 The photos below were taken by Michael Jenning and show the CAPE ST. GEORGE laid up at Naval Base San Diego, Calif., on October 11, 2017. 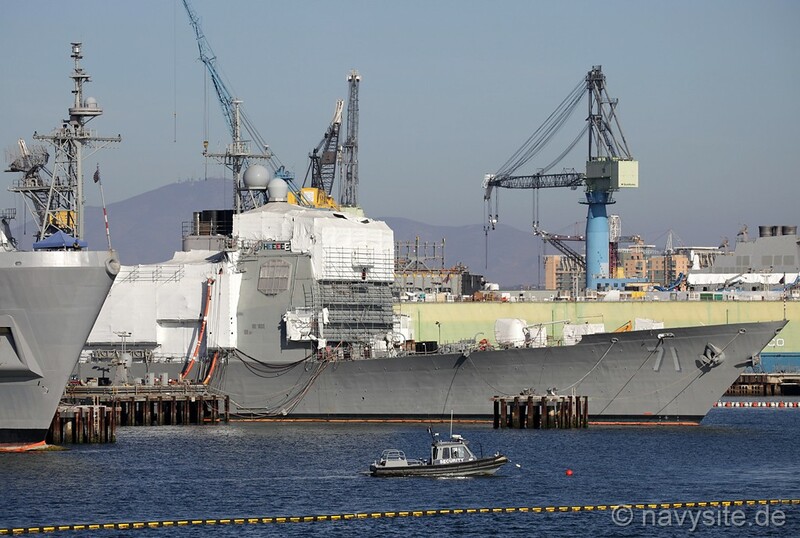 The photos below were taken by Michael Jenning and show the CAPE ST. GEORGE undergoing a Special Selected Restricted Availability (SSRA) at BAE Systems San Diego Ship Repair on September 28, 2018. 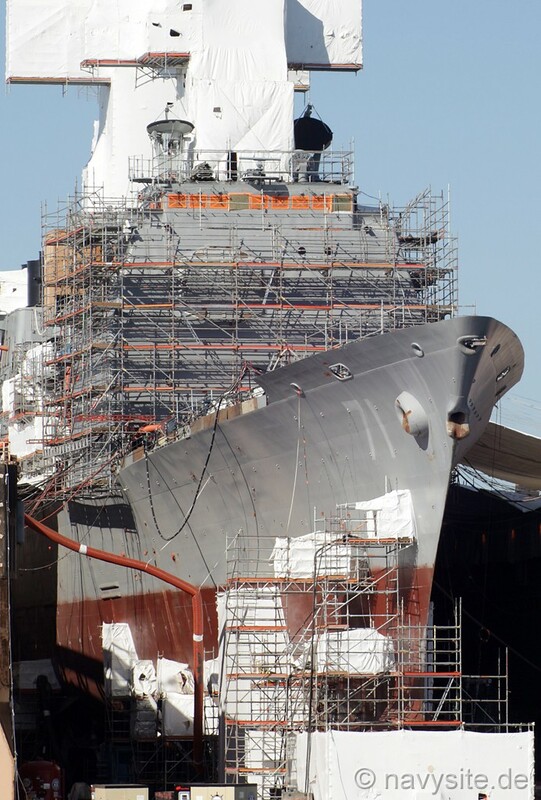 The photos below were taken by Michael Jenning and show the CAPE ST. GEORGE undergoing her Special Selected Restricted Availability (SSRA) at BAE Systems San Diego Ship Repair on March 2, 2019.